I've restored this side table from the 70s about two years ago. And since, I've reconditioned too many things, so there is no place left for this one. After arguying with a [un]friend about its price, I've sold it for 40€ on Ebay.The buyer was a no-show and the kart is still here and there is even less place left for it! I don't want to sale it; I wish to SWAP it. 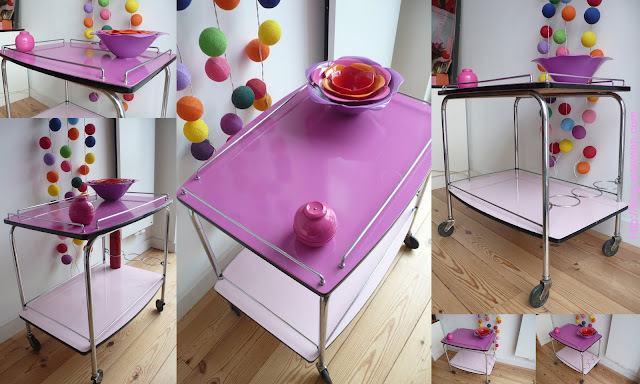 This table is for whoever [likes pink] proposes to exchange it with something original, preferably selfmade, small, big, whatever! It can be a service too but it has to be FUN. So leave a comment to this post with your swap proposal. The table is to be picked up in Brussels. Please mind that any delivery charges are on you, the lucky winner! See the table makes a great girly packshot background!